As a fan of police procedurals, I enjoyed discovering a new author, and a new setting for those books. Treachery in the Yard marks Adimchinma Ibe's debut as an author of a series set in Nigeria, his homeland. It's a novel that shows corruption, politics, and murder are the same worldwide. Lieutenant Tamunoemi (Tammy) Peterside is a homicide detective in Port Harcourt. A bomb that explodes at a politician's house draws him into a political investigation that turns deadly. As witnesses, suspects, and lawyers end up dead, Tammy's superiors warn him his investigation is going in the wrong direction. But, warnings do nothing to stop the cynical, honest cop. Instead, they only make him more determined to prove that another politician is behind all of the killings. It's going to take more than politicians or police with higher ranks to stop Tammy from working the case. His own death might be the only thing that will stop him. So many of the authors writing police procedurals set in countries other than the U.S. do an excellent job of describing the country, introducing readers to a culture we don't encounter often. Ibe is no exception. He provides a little background, describing the military junta that took over in the '80s, with their need to control the oil wells, maintain power, and keep control. He describes the difference between the wealthy and well-connected, living behind walls, and the rest of Port Harcourt, where tap water is unreliable, power outages are routine, and people can go days without electricity. Unemployment is a major issue in Nigeria, but, as a homicide detective, Ibe's character, Detective Tammy Peterside, is assured of a job. Tammy is a cynical realist, an intense man determined to solve his case. He understands why he's where he is in the police hierarchy. "That was why he was Chief, and I was a detective. He cared about politics. I cared about solving the crime." Showing his determination, Tammy realizes, "I don't like murder investigations when the bodies pile up. You have to spend a lot of time climbing over the bodies to get to the truth." I liked Tammy Peterside. I liked Ibe's succinct writing style. His turn of phrase fits his character beautifully. 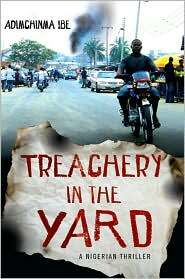 Most of all, I liked Treachery in the Yard, this debut police procedural set in Nigeria. I hope fans of foreign mysteries and police procedurals discover a setting other than Scandinavia. I'm hoping to see more of Detective Tammy Peterside and his creator, Adimchinma Ibe. Treachery in the Yard by Adimchinma Ibe. St. Martin's Minotaur, ©2010. ISBN 9780312585938 (hardcover), 160p. FTC Full Disclosure - The publisher sent me this book, in hopes I would review it. Oh, I like the sound of this one. I'm excited to read a mystery set in Nigeria. I liked Kwei Quartey's WIFE OF THE GODS, set in Ghana, earlier this year. Glad to know about this book. As I said, Kay, Ibe's writing is very succinct, but he manages to describe the state of the country and politics. And, I really liked his main character. I hope you can find this book. Oh, I love mysteries set in unusual places! And I'm a huge police procedural fan, so this sounds like a good one for me to check out. Thanks! You're welcome, Elizabeth. I find police procedurals satisfying. And, I enjoy reading ones set in unusual places, too. This one is an easy read that won't take too much of your time, either. Enjoy! This is a very good review of what sounds like an interesting book. It is quite educational to read international mysteries and one can get a glimpse of what life is like beyond the Atlantic. And I so agree that one must discover the world beyond Scandinavia! There are countries and continents to explore. I will write this book down on the to be read list and, hopefully, be able to find it in the library. So, after reading about Nigeria, kathy, my next mystery was partially set in Russia. I'm doing a very good job avoiding Scandinavia, although I read all of Maj Sjowall and Per Wahloo way back in the 70s. I have read three by Sjowall and Wahloo and am trying to get "Roseanna." I fulfilled the Scandinavian Book Challenge that Amy has going on. Read two from Australia, "Gunshot Road," by Adrian Hyland, which is very well-written, and "Truth" by Peter Temple. And I have read a new one from Italy by Gianrico Carofiglio and one from South Africa by Deon Meyer and need to read one from Latin American and one from Asia. Should be a cinch. Am trying to fulfill my informal global challenge. But I have found so many books in my Web travels that there are huge to be read lists here and I keep writing new ideas down. I want to read the book by a Nigerian author that you listed, but there are so many good, new books out now.